What? Back again? Is it possible that the miserly Ebenezer Scrooge continues to find enthusiastic response whenever he growls “Bah Humbug” year after year at Christmastime? He is not someone looking for friends, and is cranky and “crochety” year after year. Yet, he succeeds in fascinating thousands of readers and theatregoers worldwide. 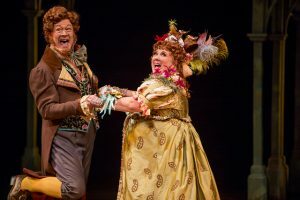 He is back on stage at Denver Center for the Performing Arts this season, and continues to be an ill-tempered charmer. 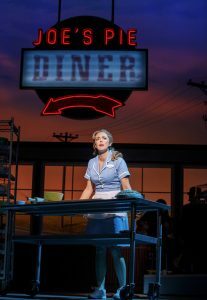 Sam Gregory plays the unhappy character this year at DCPA. He is an impressive entertainer. Memories of past Scrooges have left me with trepidation about enduring his wrath again and again. Gregory’s interpretation is a pleasant change. 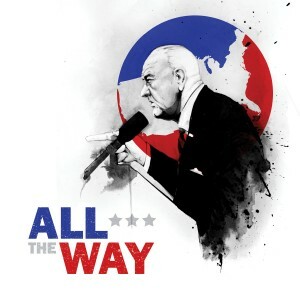 Yes, he is still scary and mean, but his portrayal of the role, as directed by Melissa Rain Anderson, has given him more humanity, and more earnest desire to make personal changes than seen in many past productions. 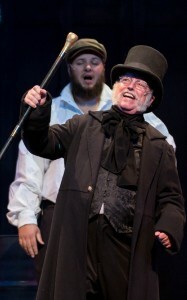 This is Gregory’s second year as Scrooge on the Denver stage. Charles Dickens was down on his luck in London in 1843. He needed a financial success to follow “The Pickwick Papers” and “Oliver Twist.” He began to work on a novella that would become “A Christmas Carol,” writing it in just six weeks. The published work appeared a week before Christmas in 1843, and the first edition was sold out immediately. The story was a tremendous success, 13 more editions were printed within the next year. Dickens went on to further renown with many of his works becoming classic literature, including “David Copperfield” and “A Tale of Two Cities.” His themes touched on the social problems of England, and the ongoing need for kindness and hope. A movie “The Man Who Invented Christmas” is currently playing in movie theatres in Colorado, looking at Dicken’s life at the time he wrote the “Carol” novella. 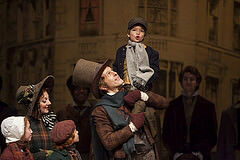 This is DCPA’s 25th season of “A Christmas Carol.” It has proved to be a landmark show – a must-see every year. 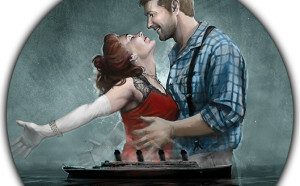 The Center continues its success in presenting the story in a beautiful setting, with skilled performers. The well-known set is as glorious as ever. The large cast is without flaw, and the Dicken’s tale has become even more relevant through the years. The Company of A Christmas Carol. Photo Credit: AdamsVisCom. 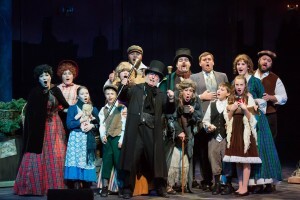 One of this year’s highlights is the convincing portrayal of Brian Vaughn as Bob Cratchit. 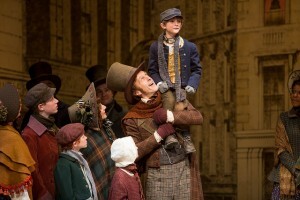 In the second act, Cratchit reminds his family of the importance of Christmas. (See quotes following review.) Vaughn’s performance is inspiring. In fact, the entire production is inspiring. The audience left the theater with a desire to be more helpful to family, friends, and those in need. The script for this year’s production is by Richard Hellesen, with music by David de Berry, interspersed with familiar Christmas melodies. Christine Rowan provides excellent choreography. The story is the same as ever – the wealthy Ebenezer Scrooge has only one employee, a kindly Bob Cratchit who is poorly paid. It is Christmas Eve. 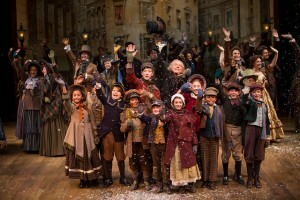 Scrooge grumbles that the impoverished London citizens have no right to find joy in the holiday season. He does, however, begrudgingly grant Cratchit permission to leave the office to be with his wife and children, including the crippled Tiny Tim. Michael Fitzpatrick, Leslie O’Carroll. Photo Credit: AdamsVisCom. Scrooge returns to his apartment, and is roused from restless sleep by the startlingly arrival of his former partner, Jacob Marley. Marley died seven years previously and is now an after-life spirit prisoner shackled by the chains of his past errors. Marley warns Scrooge that he will face the same torment when he dies, unless he changes his ways. He says that he will be visited that night, and in nights to come by three spirits representing the ghosts of Christmas Past, Christmas Present, and Christmas Yet to Come. 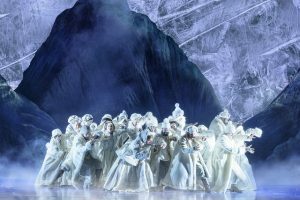 The ghosts appear, with each apparition providing Scrooge with memories of his past – some joyous, some fearful and sad, and each with a warning that he must do something now to improve his life for the future. This could be scary stuff. Some of it is. But there is always the realization that lives can change, when there is an earnest desire to do so. This is a beautiful, heart-warming, “feel good” show. The entire production is a jeweled treasure. “When I listen to you talk about your hopes, I can’t but think how Christmas changes as we grow older. Time was, when I was young when Christmas Day was like a magic ring around the world. It bound together all enjoyments, affections, hopes…And seeing everything and everyone around a Christmas fire was all I ever wanted. …” As we grow older, let us be thankful that the circle of our Christmas memories expands. Welcome, our old aspirations, which we may yet think impossible. We have not outlived you yet! And welcome, new projects and new loves, to their place by the hearth. Welcome what has been, and what never was, and what we hope may be—all our bright visions of Christmas Day For it is the season of immortal hope, and the birthday of immoral mercy—and we will shut out nothing. Nothing “Rotten” In This Giddy Delight! Welcome to the Renaissance! It is 1590. The Dark Ages are over. There is a rebirth of creative activity in Elizabethan England. 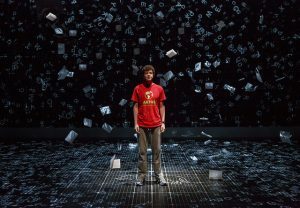 The arts are flourishing, and William Shakespeare is the rock star of the era. He is the toast of the town and his play “Romeo and Juliet” is about to open. Everyone in London is enamored with the new author. Everyone except playwright Nick Bottom. He is incredibly jealous of Shakespeare’s success, and openly announces in song, “God, I Hate Shakespeare.” Nick and his brother, Nigel, are about to lose the patronage of a local artistic funder, unless they can come up with a substantial hit — immediately. Even the author brother, Nigel, is impressed with Shakespeare’s success, much to the dismay of his brother. Nick is desperate for an idea for the potential play, and goes to the teller of the future Nostradamus, for help. Unfortunately, this is not THE Nostradamus, but Nostradamus’ nephew, Thomas Nostradamus. Thomas can also see the future, but not particularly clearly. 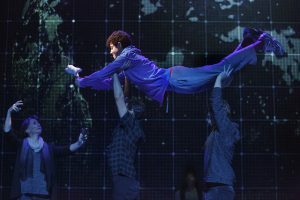 He does advise Nick Bottom that the future is going to be in musical comedy, and outlines the idea in one of theatre’s most recent delights, “A Musical.” Thomas Nostradamus has Bottom intrigued with what might happen on the stage if performers could sing, and dance, and act — all possibly at the same time. 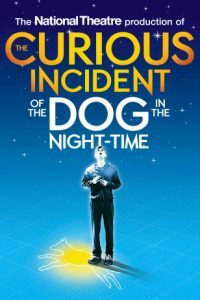 The audience is likewise enthralled, and Bottom goes to work with Nigel to provide a show that will save them from financial ruin. Thomas Nostradamus then advises that Shakespeare’s next show may be the most widely acclaimed play in history. If Bottom works now, he can have Shakespeare’s success even before Shakespeare can write his own play. Nostradamus advises that the play is to be “Omelette.” Seems that Nostradamus didn’t quite see the future, confusing “Hamlet” with “Omelette.” The ensuing result is hysteria as “Omelette, The Musical” is being prepared. 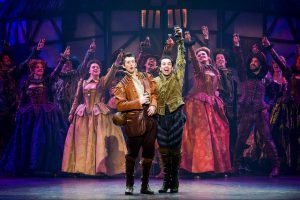 “Something Rotten” then becomes a Broadway show to be reckoned with. 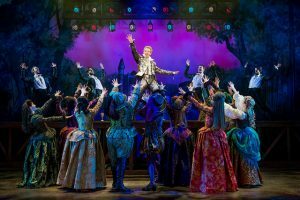 There are bits of Shakespeare’s most quotable lines and snippets from Broadways most-seen musicals. 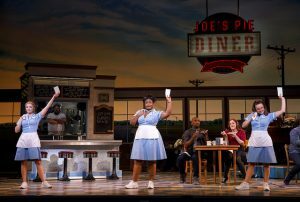 The theatre-savvy Denver audience was in awe with the hijinks, audibly delighted when they recognized each show or lyric mentioned. This is enormous fun. Supporting players are equally as talented with Blake Hammond as Nostradamus, Jeff Brooks as Shylock, Scott Cote as Brother Jeremiah, Maggie Lakis as Bea, and Autumn Hurlbert as Portia. 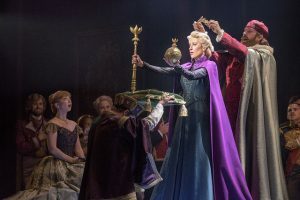 Hurlbert has the look and sound of Kristin Chenoweth, as she plays the daughter of the stern Puritan leader who literally falls head over heels for Nigel Bottom. The cast is large. The sets, costumes, and lighting impressive. The dancing is first rate. 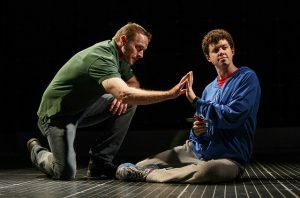 In addition to the show-stopping “Welcome to the Renaissance, ““God, I Hate Shakespeare,” “Will Power,” and “A Musical” is the lilting “To Thine Own Self” — an impressive plea for everyone to take responsibility for the way they behave. 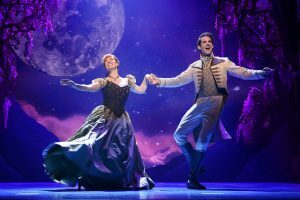 There is nothing “Rotten” about this delightful transfer from Broadway. It opened in New York in 2014, receiving rave reviews. It is a rewarding, rollicking evening of energy, silly sophistication, and charm. 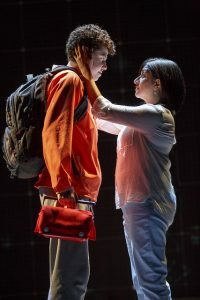 In addition, it involves the audience, trying to figure out which Shakespeare quotes are from which plays, and which crazy bits and pieces are from Broadway musicals. Photo Credit: Jennifer M. Koskinen. 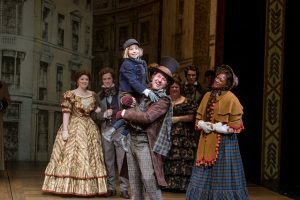 I can only add, “Right on!” In the DCPA’s 35-year history, the Company has presented two different adaptations of “A Christmas Carol” totaling 22 productions! By now, the Company has it down pat! 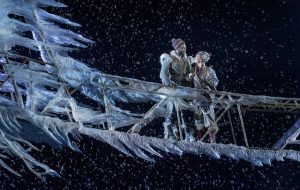 The scenery, lighting, sound, costumes, cast – all to perfection! 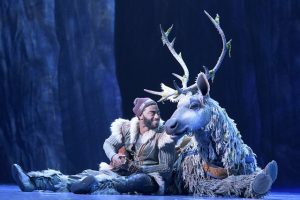 Why, oh, why has it taken me so long to drive to Denver to see this terrific production? Philip Pleasants as Ebenezer Scrooge has already played the role in nine different productions, but keeps the performance alive, as if it were his first time pleasing an audience. He is the Humbug that we love to hate, the man who believes any happiness around him is misplaced, and lives only to count his money and make life as miserable as possible for everyone – including his nephew, his only relative! His only employee, Bob Cratchit, has the audacity to ask Scrooge for a day off for Christmas. He is aware that his boss is a dreadful sort, but asks anyway, and is nearly rebuffed. James Michael Reilly plays Cratchit to perfection. 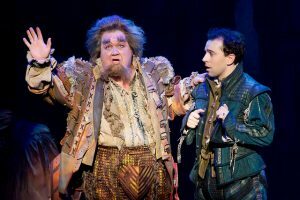 His performing credentials are substantial, and he brings a great charm to the role – that of a very good man, trying his best to take of his family in difficult times, and putting up with Scrooge, as his only source of income. The London in the 1840s was a difficult place to live, especially for the many with limited financial resources. Charles Dickens published his story “A Christmas Carol” in 1843 and it has become the epitome of a Christmas classic. Ebenezer Scrooge’s only option of refuge is his bedroom, after Cratchit has gone to be with his wife and children. 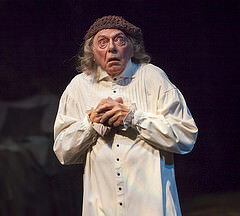 Scrooge is confronted by a dream of his former financial partner, Jacob Marley, now shackled in chains to endure the eternities because of his devious deals while alive. Scrooge is horrified, only to learn that he is to receive visits of three more ghosts in the days to come: The ghosts of Christmas Past, Present, and Future. Each one frightens Scrooge with promise of a future as dreadful as that faced by Marley unless he does something worthwhile with his life. This is not a sugar-coated Christmas tale, but one of Christmas carolers, of families in poverty – of ghosts raging to frighten some sense into Scrooge. The set is terrific, as if everything else in this wonderful version of Dickens’ story. There is lots of music and dancing. Thought-provoking insight of the idea of “sharing,” and basically the encouragement of helping those less fortunate. The enormous cast includes several in supporting roles. 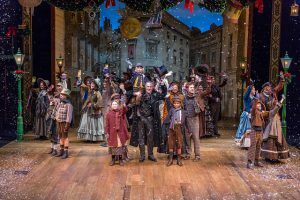 Especially noteworthy are Colin Alexander as Scrooge’s Nephew, Fred; Charlie Korman as Ebenezer as a child; M. Scott McClean as Ebenezer as a young man; Leslie Alexander as Mrs. Cratchit, and Stephanie Cozart, terrifically adorned as the Ghost of Christmas Past. 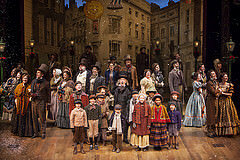 There are many children in the cast, making the production of special interest to younger theater-goers. The production is flawlessly directed by Bruce K. Sevy. Adaptation of Dickens’ story was done by Richard Hellesen, with music by David de Berry. The end result is the desired realization that Scrooge can become teachable. He can learn some basic goodness, and realize the need of “sharing.” And while Scrooge is learning, the audience is treated to a visual feast of Christmas! 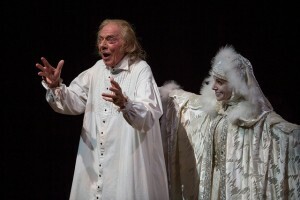 “A Christmas Carol” at DCPA in December of 2014 is a production to be cherished! Vanya and his adopted sister, Sonia, are getting on each other’s nerves. Their “day” consists of a morning coffee, watching for the heron on the pond outside their window, and … not much else. They have lived singular lives in this routine of nothingness for several years – ever since the parents they were taking care of died. They might actually like to do something with their lives, but just can’t get around to it. The spark in their existence is the housekeeper, Cassandra, who drops in once a week, claiming she can foresee the future – and it doesn’t look good! She’s barely five feet tall, but she just can’t be stopped! The miners in Leadville are in awe of her, including J. J. Brown who marries her, but can’t control her! Denver society look down their noses at her, and European nobility are in delighted by her. 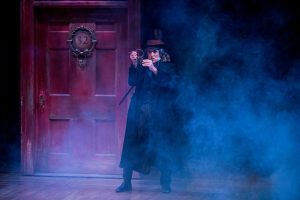 Also in awe are the audiences at The Stage Theatre of the Denver Center of Performing Arts as Beth Malone proves to be unstoppable as the tough Molly Brown!